Whether you live in a dorm, apartment building, or share a home among friends, your college home is full of valuable items: textbooks, a computer and/or tablet, your smartphone, all of your favorite clothing, maybe some high-end headphones, or a tv and gaming console… the value adds up quickly! Property crime and theft are consistently the most common reported crime on Michigan college campuses*, according to FBI data. Add in a nationwide average of 4,100 dormitory fires per year, and you’ll certainly have a reason to ensure your possessions are protected. *Want to know how your school measures up? Check out the FBI’s statistics for reported offenses on Michigan college and university campuses. Could you afford to buy all new items in the event of a fire? Would your stolen Macbook be replaced before your next writing assignment is due? If you can’t afford to replace your possessions, insure them! Living on-campus? Your belongings may be covered by your parents’ homeowners insurance at no extra cost. Review your parents’ home policy for “off-premises coverage” limits; many homeowners policies only provide 10% of the stated limit for personal belongings that are kept away from home. If your parents homeowners insurance policy provides $50,000 in coverage for belongings, your belongings kept at school are only covered for up to $5,000. Know the limits – certain items, including computers, have coverage limits. If the value of your item exceeds the limit, you’ll want to specifically schedule the item on your parents’ policy. Living Off-Campus? 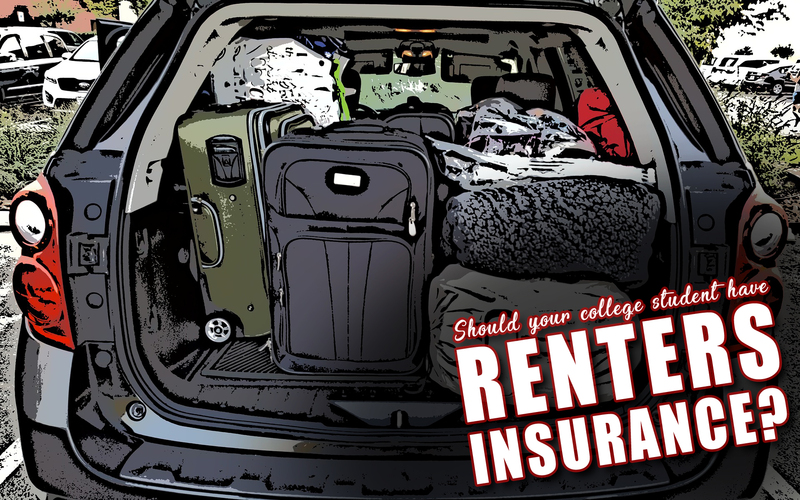 Whether your’re renting a home or an off-campus apartment, your belongings likely are NOT covered by your parents homeowners policy. You’ll want your own coverage via a renters insurance policy. Age is a Factor: Older than 26? Your parents homeowners policy does not cover your belongings while you’re away at school. You’ll want your own renters insurance policy. Got a Landlord? The landlord or property owner’s insurance does not cover your belongings. Shared Policies: Got housemates? While roommates can all share one policy (and thus, the cost), there are drawbacks –claims filed by any roommate will stay on your claim history – and affect future insurance premiums – for a number of years. Personal Property Coverage: Covers your personal belongings from loss, fire, theft, or a number of other situations. Review a list of perils to learn what your policy protects you against. Liability Coverage: Can help protect you from lawsuits if someone gets hurt at your apartment, or if you cause damage to someone else’s property. Additional Living Expense: Severe damage to your apartment? This coverage provides funds for temporary housing and meals if you can’t live in your rental. Low Cost! Many renters policies cost less than $20 per month. Multi-Policy Discounts: Got auto and renters insurance? Earn multi-policy discounts for having policies with the same insurer. Assess your valuables. How much would it cost to replace your belongings? This is how much Personal Property coverage you’ll want for yoru belongings. Inventory. For higher value items, record model numbers and serial numbers. Save this information to an email or cloud storage account so you can access it from anywhere. Determine Reimbursement Type. Decide whether Actual Cash Value or Replacement Cost coverage is right for you. An Actual Cash Value policy pays you for what your items are worth at the time of loss – age and depreciation are factored in. With Replacement Cost coverage, you’ll be reimbursed for the full, brand-new cost of the item (but you’ll pay a little more for Replacement Cost coverage, too). Contact Us! Speak with an agent for a free, no obligation renters insurance quote! ← What Is A Personal Umbrella Policy?